MetalFil™ - Classic Copper is an incredible new metal-filled PLA-based filament with approximately 80% of gravimetric copper filling. This incredible high filling with copper powders enables every FDM 3D printer user to 3D print copper objects which are almost indistinguishable from genuine copper. The extremely high copper filling in MetalFil™ - Classic Copper has resulted in an incredibly heavy filament with a density of 3.5 g/cc. Unlike other metal-filled filaments MetalFil™ - Classic Copper can be printed on full metal, PEEK, and PFTE hotends and can perfectly be printed with 0.4mm nozzles. 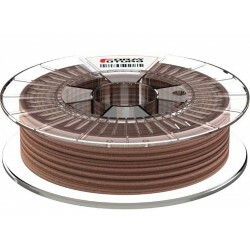 This makes MetalFil™ - Classic Copper basically perfectly suitable for all FDM 3D printers. You can even enable retraction settings on both direct drive extruders, as well as on Bowden style extruders, which is a truly unique feature for a metal-filled filament. MetalFil™ - Classic Copper is a very easy to print material and ensures stable 3D printing results on basically all types of FDM 3D printers. This makes MetalFil™ - Classic Copper a perfectly suitable filament for beginners and intermediate 3D printing enthusiasts, whereas other metal-filled filaments are only suitable for experienced users. Once printed MetalFil™ - Classic Copper objects can very easily be brushed with a brass brush or sanded with a fine grid sandpaper. By brushing and/or sand grinding your printed object you will brush/shine up the high concentration of copper powders. After being brushed and/or sanded MetalFil™ - Classic Copper will reveal its white polish feature. A very thin white layer/haze on your object will now allow you to easily polish your 3D print into a beautiful copper object. Post processing a MetalFil™ - Classic Copper 3D printed object with a rotary tumbler will make your FDM 3D printed object indistinguishable from genuine copper casted objects. You can create several patina effects on MetalFil™ - Classic Copper printed objects in just one day time. With a soldering fluid treatment you can for instance easily create a beautiful ancient green weathering effect on your copper object.